I always have been and always will be a denim girl. It’s time to trade in all those denim shorts for pants as we are finally feeling a little big of fall in LA. I always love a good denim on denim combo and the perfect way to slip into fall being warm enough with the new lower temperatures without having to wear a jacket. SCORE! I scooped up this denim combo at Old Navy for a steal. Excited to be collaborating with them for a series of posts to show some of their latest trends you can find in store and online. 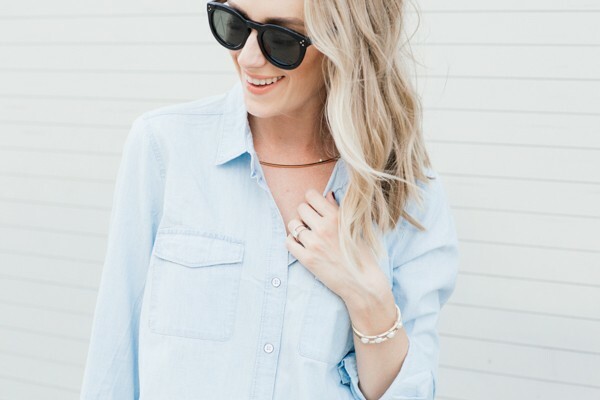 I am pretty picky when it comes to chambray tops because I want them to be soft and buttery. This one is amazing and so cozy. I always size up in denim button downs so I get more of an oversized, borrowed from my hubby, kind of look. This day was all about dressing up my denim for a little cocktail date. Love that adding some simple black accessories and a scrappy sandal make this look perfect for evening. Natali - Fantastic denim on denim outfit! I love how you’ve kept it minimal and elegant. elza - love the shirt, you look super gorgeous! Rachael / The Paraders - Denim is such an easy go-to…I love this combo! Kriti - Love this simple, classy outfit. Especially obsessed with your bag! 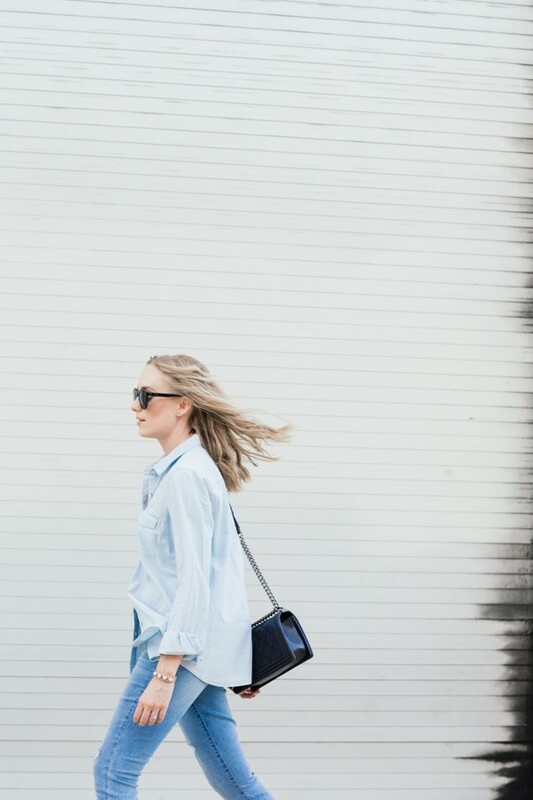 Taylor Winkelmeyer - Always love a good denim on denim look. This one is perfect. Chrissabella - I love a good denim on denim look and this look is just perfect! Love that you paired the outfit with strappy heels. Nicolette - Oh wow I love the photos of this post! That unintentional, almost grungy, ombre door add the perfect touch! Needing that Old Navy top – especially since you said it’s so soft because that is a must. Lovey - Such a beautiful look! I’m obsessed with denim lately and cannot (will not) stop wearing it! Rachel - Loving these colours. Kathy - You look fantastic in this denim on denim look. I’m always afraid to try this look so thanks for giving me some great ideas! You look perfect! 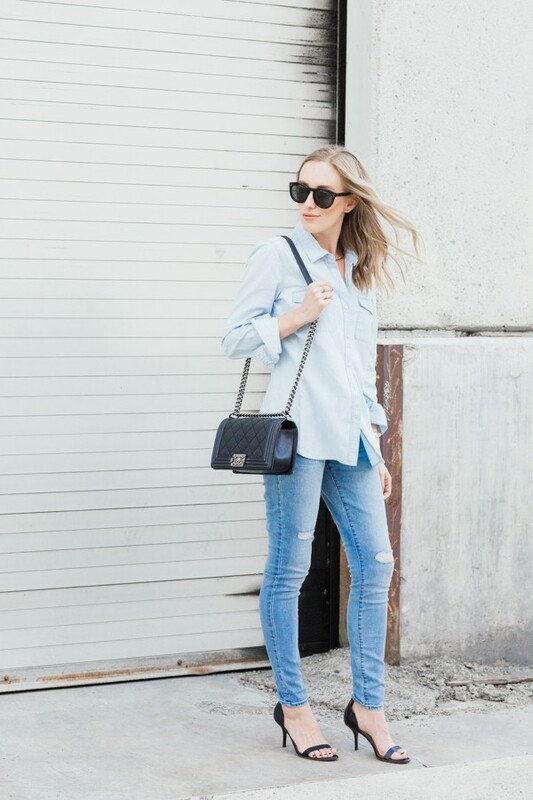 melissa - Love this denim on denim look! Michelle Lee - perfect denim outfit!